We have published two versions of this map, showing how the area developed across the years. This busy, fascinating map captures the centre of Brentford and the area to the west, stretching as far as Syonhill Farm and Wyke House; and from Brentford Dock northward to Boston House and White Stile Road. The 1894 version is a map of contrasts, with all the bustle of Brentford in the east half of the map, and many orchards in the western half. Features include Brentford Dock, numerous wharves, the River Brent and Grand Junction Canal, High Street and New Brentford, The Butts, the LSWR railway and Brentford station, the GWR Brentford Branch with its station, Brentford End, Town Hall, Windmill Road, malthouses, Thames Soap Works, St Lawrence's church and cemetery, the northern tip of Syon Park. The 1935 map shows the area largely built up, with many major factories along the Great West Road. 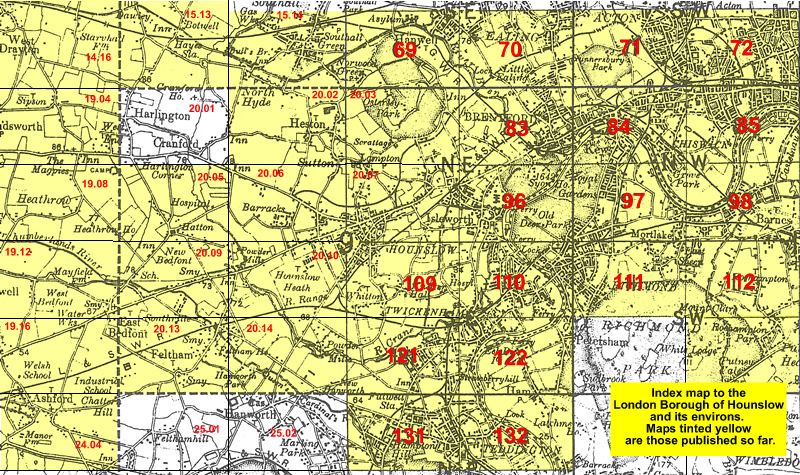 The map links up with London Sheets 70 South Ealing to the north, 84 Kew to the east, 96 Isleworth to the south; and with Middlesex Sheet 20.03 Osterley Park to the west.